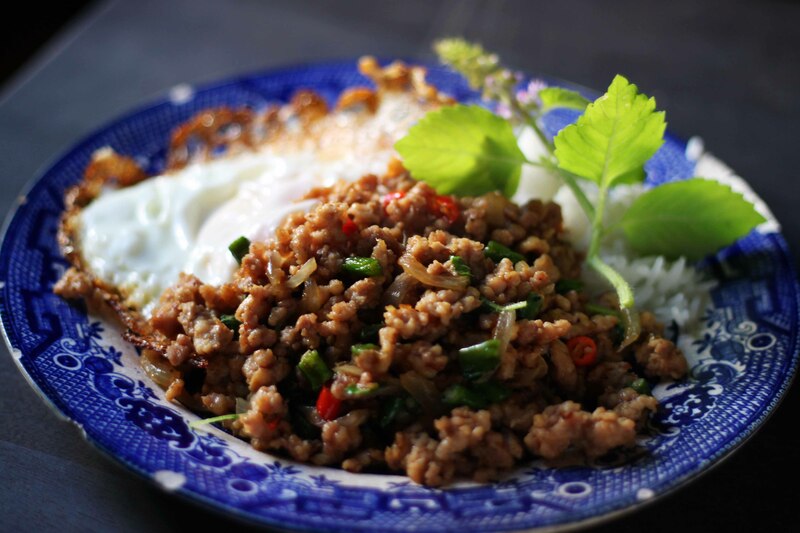 I’ve been eager to make the duck laap (sometimes spelled larb) from the Pok Pok book (laap pet Isaan), and in a friendly email exchange last week the book’s coauthor, JJ Goode, made it clear that it was essential that I make this dish as soon as possible. This is definitely the most complicated laap I’ve made. Despite the hassle, it’s definitely worth soaking, drying, and then, slowly, toasting the sticky rice. In the past I’ve just toasted raw unsoaked rice, and it’s been fine—great even. But the soaking and gradual toasting—it took about 45 minutes of constant stirring—resulted in a crisp, delicate, almost ethereally light toasted rice powder. Luckily I made a big batch. Get a child helper to pound the toasted rice and then the galangal paste. The first time I ever had larb I’d made it myself from an old Saveur recipe that called for the juice of something like five limes. It occurs to me now that perhaps they meant five very small limes, like the Key limes I’ve been using for all of these Pok Pok dishes, because this recipe calls for only 2 tablespoons, and every professionally prepared version of the dish I’ve had since then has been significantly less lime-y than my own. I still prefer more lime, with the acknowledgment that it might not be entirely appropriate. The minerally liver, finely chopped with the rest of the meat, gives the whole thing an earthy depth, and I’ll probably try to incorporate it in all my non-fish larbs going forward. As JJ suggested, you can totally make a double batch in a large-ish wok. I also made a bastardized version of the phat khanaeng (stir-fried Brussels sprouts) from the book. I used gai lan (Chinese broccoli) instead of Brussels sprouts, and fudged the Thai oyster sauce, which I didn’t happen to have. It was brilliant anyway, spicy, sweet, salty. 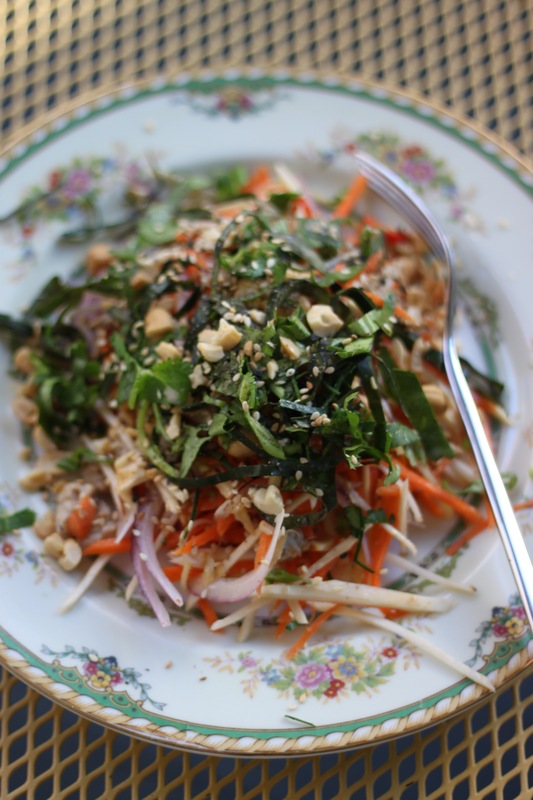 Another Saturday, another few dishes from Andy Ricker’s Pok Pok. First, for breakfast I made the very simple khao phat muu (Thai-style fried rice with pork) but used some leftover ground turkey. A little fish sauce, Thai thin soy sauce, a little sugar, and the limes (well, that’s a pink lemon at the very bottom edge of the photograph up top—they were cheaper than the limes at the Super Saver last week, weirdly) make it altogether different from your typical Chinese fried rice. If you’re looking for an easy recipe to serve as a jumping-off point, this would be a good one to start with. My daughter and I went to an Asian food store I hadn’t been to yet (Jung’s) and were pleasantly surprised to find it well stocked with Korean and Japanese ingredients—most of the Asian grocery stores in Lincoln are Vietnamese-centric. The proprietor asked what we were cooking, and told us she is Thai! Or at least speaks Thai! It was very exciting! She told us in great detail how to use the refrigerated Korean salted shrimp in a zucchini dish, and convinced me to buy a large packet of beef soup granules (first two ingredients are as you’d expect: salt, MSG), which she said would make it even better. The shrimp jar is large (it’s on the right in the picture below), so I’ll take her suggestions happily. As we were leaving: “Come back soon! I’ll tell you more!” We will be back. Quick swing over to Little Saigon, where Thalia convinced me to buy a coconut, then the Natural Grocers for—what else?—zucchini, and we were all set. Next up: frying lots of shallots, which I then forgot to put on the yam samun phrai (Northern Thai–style herbal salad): a warm, slightly sweet dressing with a little coconut milk is tossed with julienned vegetables and then topped with chiffonaded herbs. I also forgot that our Thai basil had frozen, and I hadn’t picked up any at the store, so that was missing. I couldn’t find white turmeric root so used Ricker’s suggested substitution of parsnips and ginger, which gave it a woodsy, slightly bitter flavor that I liked a lot. On top I used sawtooth herb (culantro), regular cilantro with the stems, betel leaves, and kaffir lime leaves, plus chopped roasted cashews and toasted sesame seeds. It took half a day to make, but was a very satisfying lunch. I probably didn’t need to make anything else for supper, much less dessert, but, well, it was something to do, so I kept cooking and made a Dutch oven’s worth of jaw phak kat (Northern Thai mustard green soup with tamarind and pork ribs). 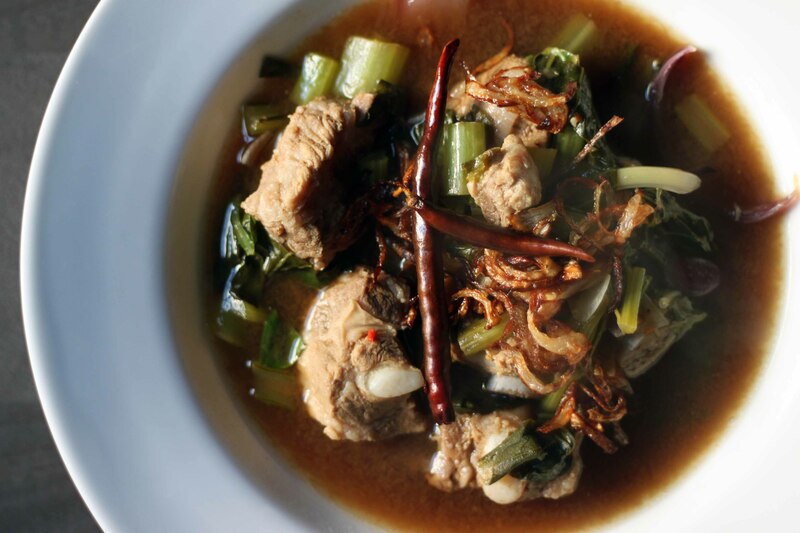 The cross-cut pork ribs are simmered for half an hour or so, then a paste of chiles, garlic, shallots, and fermented fish products of various sorts is stirred into the simmering water, along with tart tamarind water to make a murky, funky, hot-sour broth. 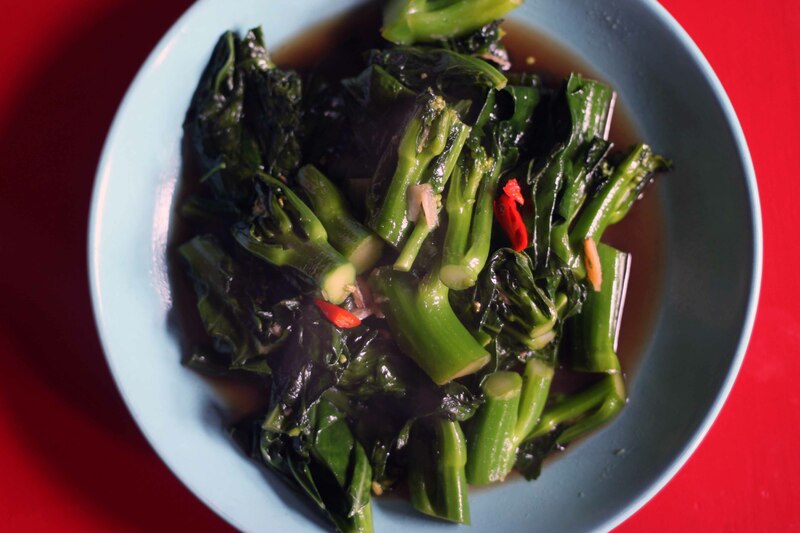 Chopped yu choy and wedges of onion are piled into the pot to steam and become tender. I remembered those fried shallots for the top, and fried arbol chiles gave some bites a little more heat. It’s a homey, comforting, wintry soup, and we have about six servings of it left in the fridge. 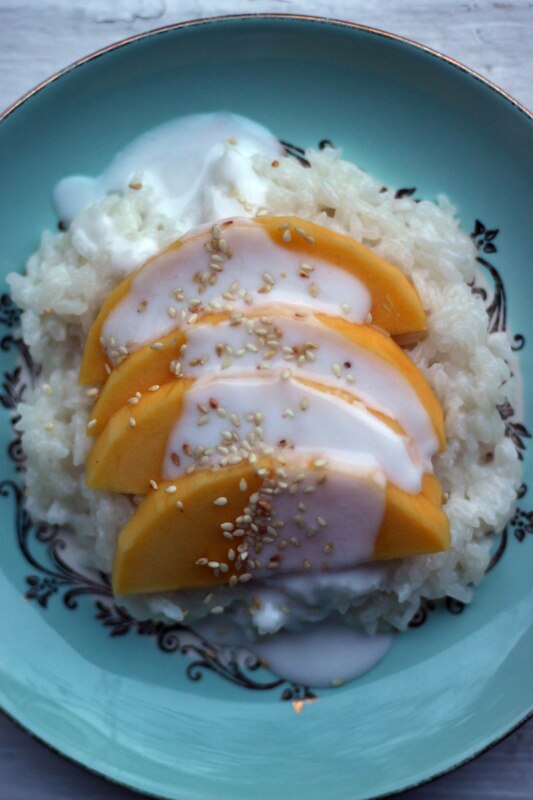 I want to tell you about dessert, too, the classic khao niaw mamuang (sticky rice with mango and salty-sweet coconut cream), and confess that I still have not purchased a sticky rice steamer. But I didn’t need it, so I probably won’t get one after all—I have enough stuff in my kitchen (and mud room, and basement). Try this: Find an aluminum cake pan and poke a bunch of holes in the bottom with a small nail. Put a couple inches of water in a pot and shove the perforated cake pan down into the top, letting the edge catch on the rim of the pot. Spread the soaked and drained glutinous rice in the pan (you could first line it with rinsed and squeezed cheesecloth for ease of turning the mass of rice later, but I didn’t bother), put a double layer of paper towels over the pan (not shown below) to keep the closure as tight as possible at the edges, then shove the pot lid down as tight as you can. Steam until just about tender, then use a spatula to flip the rice over in the pan so that the layer that was on top is now on the bottom, then steam a little longer until all is just about tender. Stir the warm rice into sweetened pandan leaf–infused coconut cream, top with mango, drizzle with salty and not as sweet infused coconut cream, sprinkle with toasted sesame seeds. It was amazing, even—or especially?—with the slightly underripe and thus tart mango, which offset the sweet coconut cream. I warmed up some leftover sweet rice for breakfast this morning and am finding it hard to get moving now so I would not recommend doing that yourself. It’s here. Pok Pok: Food and Stories from the Streets, Homes, and Roadside Restaurants of Thailand, by Andy Ricker with JJ Goode. For the last few days, since my copy arrived, I’ve been reading and flagging and planning, and yesterday I dove in for real. I picked out a few of the simpler-looking recipes to start with, then hit 27th Street in search of ingredients. I had a lot of what I needed already, and most of the rest I was able to find, remarkably, in one Vietnamese grocery store (Little Saigon, if you’re local). I’d just run out of the fancy Vietnamese Red Boat fish sauce I’d gotten for the first time a while back, so I was happy to pick up a Thai version, Squid “premium,” which is indeed excellent and well worth the extra buck or so. Healthy Boy Thai thin and black soy sauces, a Thai-made maggi “seasoning sauce,” dried shrimp (size M), Key limes, the right rices, and so on. The only thing I could not find for this batch of recipes was a Thai-made fermented fish sauce, the murky, sediment-heavy kind; I could only find very old bottles of Vietnamese brands, so I left them there. Noted the availability of fresh pig’s blood, which I’ll need when I’ve worked my way up to the laap meuang, but not quite yet. 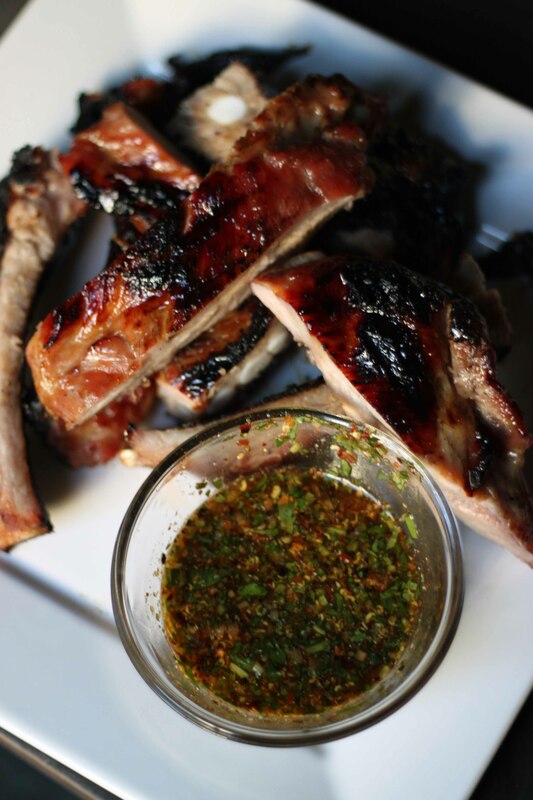 My plan: sii khrong muu yaang (Thai-style pork ribs) with jaew (spicy, tart dipping sauce for meat), kai kaphrao khai dao (stir-fried chicken with hot [holy] basil), jasmine rice, and tam taeng kwaa (Thai cucumber salad). 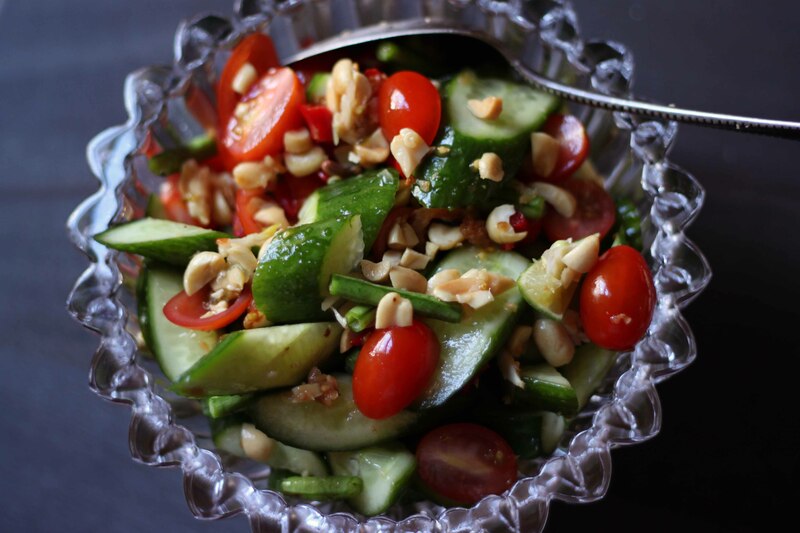 The chicken dish and the cucumber salad, as it turns out, are the featured recipes on the book’s Amazon page, probably because they’re easy and broadly appealing—head over there to see the full recipes. For the stir-fried ground chicken dish I bought a flat of boneless, skinless chicken thighs and dug our trusty meat grinder out of a packing box in the depths of the sewing room. I sent Thalia out to our little vegetable garden to pick all the holy basil she could find; I figured I should make this dish right away, before our herbs freeze (true holy basil, which is not at all the same as sweet Italian basil or purple-stemmed Thai basil, is hard to find in stores even in Lincoln; best to just grow your own, as I do). I used all fresh Thai chiles rather than a combination of fresh and dried, but otherwise I followed the recipe pretty much exactly (which is rare for me), and it was wonderful: lots of mortar-pounded garlic, a handful of sliced onion, a handful of diced long beans, a slurry of sweetened soy and fish sauces, lots of holy basil. Next time I’d probably use a little less sugar. The musky-smelling holy basil, sweet and molasses-y Thai black soy sauce, and the nubbin texture of the home-ground chicken made this humble dish quite special. I loved how the soft yolk of the fried egg melted into the stir-fry and gave some bites a silky richness. For some reason (squeamishness?) I did not buy the cross-cut pork ribs at the Asian place, but went to the Hy-Vee supermarket instead, thinking the butcher there could just saw a rack in half for me. He said he wasn’t allowed to do that. I went ahead and got the uncut rack anyway, and just cut it between the bones into four sets of ribs, which I think worked just fine. I won’t be shy next time, though: I’ll get them at Little Saigon. The ribs went into an interesting marinade of honey, thin Thai soy sauce, shaoxing wine, grated ginger, sesame oil, white pepper, cinnamon, and nutmeg (what?!). I let it marinate for just about two hours, but next time I’ll do it farther in advance—at least overnight. I don’t think a lot of the spice flavors came through after long, low grilling and last-minute basting with thinned-out honey. Ricker takes great pains to warn readers that these ribs will not be fall-off-the-bone tender, like some Southern U.S.–style barbecue ribs (which really shouldn’t be falling off the bone either, if you ask me), saying they’re supposed to be a bit chewy. They were, but not at all in an unpleasant way. I cooked them with charcoal in the smoker at 200 to 225°F for maybe two and a half hours. Finally, a classic Thai salad, som tam, with Persian cucumbers, long beans, sweet grape tomatoes, chopped Key limes, toasted dried shrimp, palm sugar paste (the bane of my existence; I just loathe scraping it out of the tub; if there’s an easier way to deal with tub palm sugar, please let me know in the comments! ), fish sauce (ideally half regular, half fermented; I used all regular), fresh Thai chiles, and chopped roasted peanuts. I do not have a big clay mortar and pestle for making dishes like som tam (such as the more familiar green papaya salad), but I don’t think it’s necessary. I put everything in a bowl and used a little ceramic pestle to gently pound it in what I think was a good approximation of the way Ricker describes in such thrilling detail. For that matter, I have no wok (left it in Georgia when we moved and haven’t found another yet that’s just right), I have no granite mortar, nor a sticky rice steamer, nor a lot of other “absolutely necessary” kitchen tools. I’d urge you to go ahead and make these recipes, though, whether you have everything you need or not. Buy the book, or check it out from the library, or borrow it from a friend, and get started! 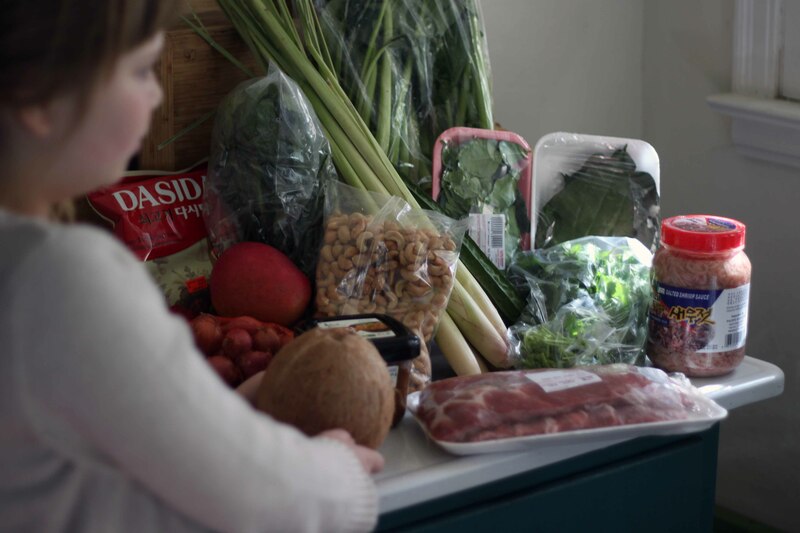 There are pictures of all the unusual ingredients, and friendly, helpful tips for finding what you need. If you don’t have a wok, use a sauté pan. If you don’t have a clay mortar, use a bowl. If you don’t have a rice cooker, use a pan, for crying out loud. If you don’t have a sticky rice steamer thingy, figure something out! 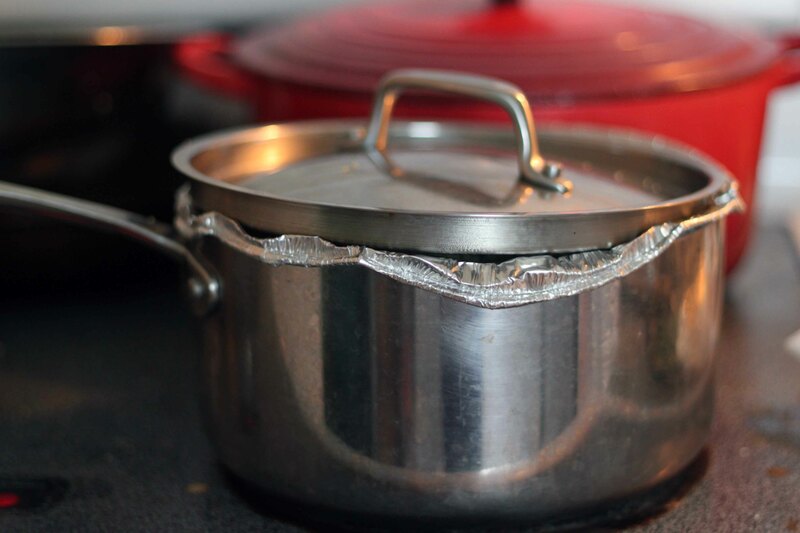 (Maybe try my makeshift couscoussier setup: perforate a round foil cake pan and shove it into the top of a large saucepan; line it with rinsed and squeezed cheesecloth, fill with the soaked rice, put the lid over the pan, and steam.) The point is, if you have a free weekend and a craving for sour, spicy, salty, sweet, funky, you should cook this food.